Strawberries & balsamic ... a match made in tasty heaven! 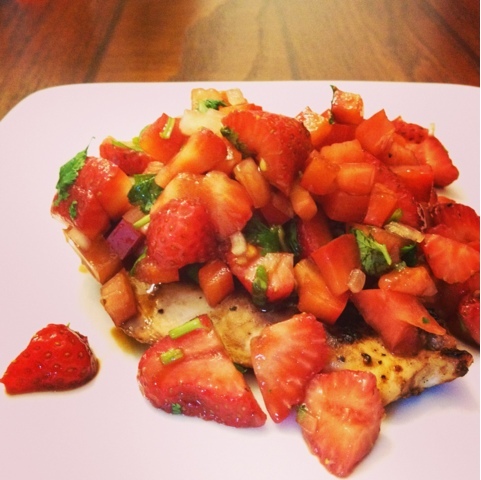 Tonight we're making our grilled balsamic chicken topped with fresh strawberry salsa. This is the perfect dinner to serve up at your next BBQ (July 4th anyone?) as it's easy prep so you'll have plenty of time to spend with your guests, you can toss it right on the grill and the salsa serves as a double duty appetizer and topper for your chicken! You'll want to make extra! 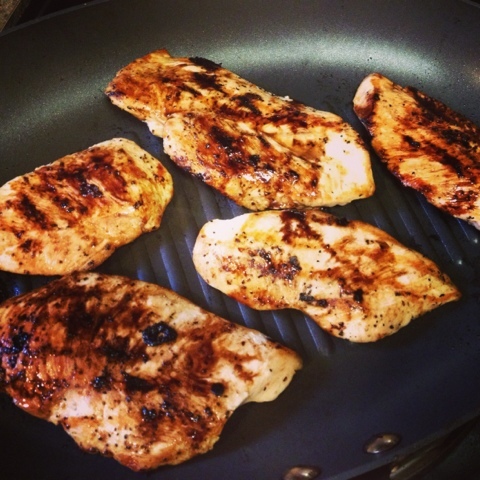 We marinate our chicken for just 10 minutes in sweet balsamic vinegar then grill it up. 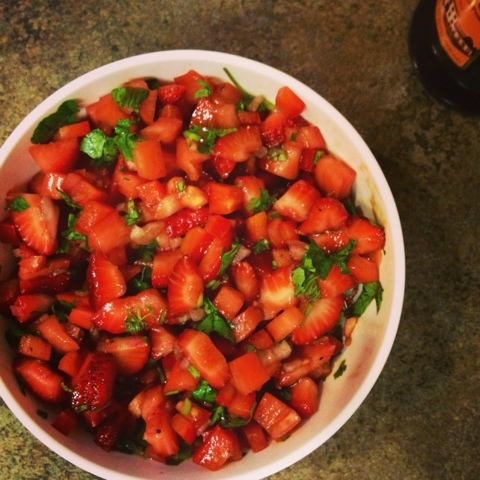 Our salsa is a fresh combination of juicy strawberries, ripe tomatoes, crisp bell pepper and seasoned up with onion, cilantro and a splash of balsamic vinegar to finish. And at only 255 calories per serving, no guilt in cracking open a bottle of white wine with this meal. Hope you enjoy this summery supper! 1. Place chicken in large zip lock bag with balsamic vinegar & garlic powder. Refrigerate for 10 minutes. 2. Remove chicken from bag and shake off any excess vinegar. Heat grill pan (or grill!) to medium high heat and cook for 5-6 minutes on each side until cooked through. 3. Dice strawberries, tomato and bell pepper and add to bowl. Chop onion and cilantro and stir into salsa. 4. Add balsamic vinegar and stir to combine. Season with salt & pepper. 5. Plate up one piece of chicken and top with 1/4 of your salsa. This sounds like a perfect summer dinner! Yummm!